So here's the deal. Some events this past week have put me in a bit of a mood. A reflective one mostly. Which is good. I think it's always wise to stop and reflect occasionally. You know, to make sure you are headed in the direction you want to be headed. Here's what happened. One of my favorite bands put out a request for people to share with them their stories that need to be told. Stories that need to be shared. I was thinking about it and I don't really have a very interesting story of my own. Yes, I've had things happen to me. But, over all, I've lived a rather ordinary life. I don't really have a grand story to tell. I'm pretty ordinary and I'm ok with that! So after much thinking, I changed the question from "what is my story" to "what will the story be that people will tell about me?" Kind of a scary question as I can think of some people who might not remember good things. (luckily people can change, right?!) But, on the other hand, I think - at least I hope - some people will be able to tell the story about me being kind to them. Kindness matters! I really believe that, no matter how small the act. However, sometimes though I just go through the motions of my everyday routine, kinda lost in my own schedule, and I forget to reach out and do nice things. Because of this, it always helps to have little reminders or prompts, to inspire me to be a little kinder. I know, I know. Kindness shouldn't require a reminder but having one can't hurt. For me, March 28th will always be a reminder day - a day to remember to share kindness. It all started last year when I was incredibly touched by an act of kindness from a stranger . On March 28th she bought me and Mr. K a smoothie. Such a simple act yet the story behind the act it is one I will always remember. It is one of those stories that is worth sharing. (maybe Imagine Dragons should hear about her story). This woman, who I had never met, was out in our community doing random acts of kindness in honor of her sweet daughter, Liz, who lost her life unexpectedly at a young age - her daughter was only 24. In order to help heal a broken heart and share her daughter's legacy, this mom, on the anniversary of her daughter's passing, was out sharing kindness. Last year, I drank my smoothie and then tried quickly to pull something together to turn around and share kindness with a few others. I didn't have much time, just an afternoon, but we made it work. This year though, I have more time to think ahead and plan. 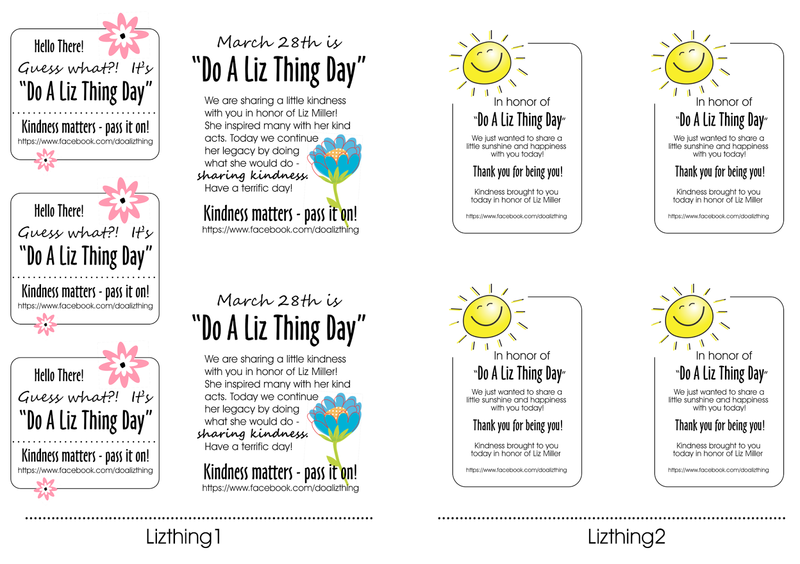 I would love, love, LOVE it if my readers joined in with me and next week, on Saturday - March 28th, and did something nice for someone else. It can be simple like, well, buying someone a smoothie. Or maybe passing out little gifts in a parking lot. Maybe you can paste coffee gift cards on the bathroom stall doors at your work. Or maybe there is a neighbor that needs help doing yard work. The possibilities are endless! My only request is that you come back and tell me what you did and the city you live in. Just leave me a quick comment. I'd love to plot the locations on a little map and share with this sweet mom all the places that kindness was shared in her daughters behalf. I can only hope that that would help fill her heart with a lot of love on a day that would normally be a difficult one. 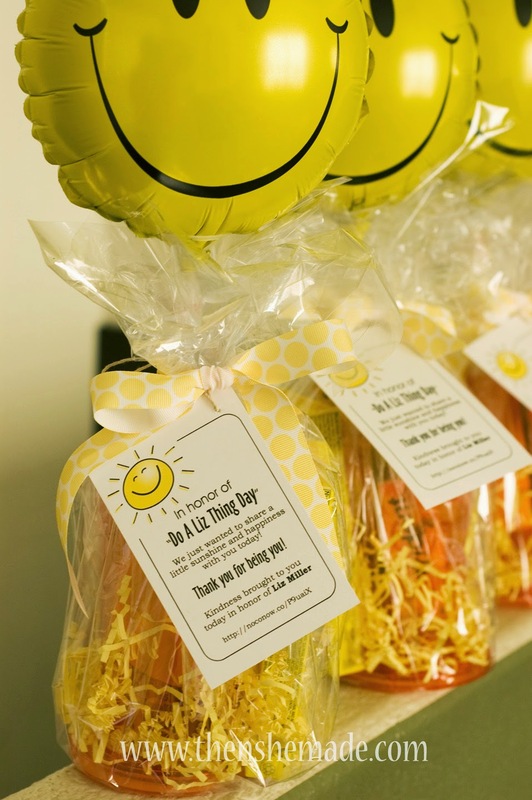 Last year, we made little gifts of Sunshine and gave them out in parking lots. We bought a few yellow and orange things and I made a quick tag to match - I put the tag up on Google drive so anybody could down load it and use it if they wanted. I have updated that tag and also made a few others. You can find them here Lizthing1 and Lizthing2. If you are going to pass on a gift, add a tag so the person receiving it will know about Liz and can look up her story on Facebook. And, to get the juices flowing, this coming week I will be posting little DIY ideas that you can make as little gifts for people. 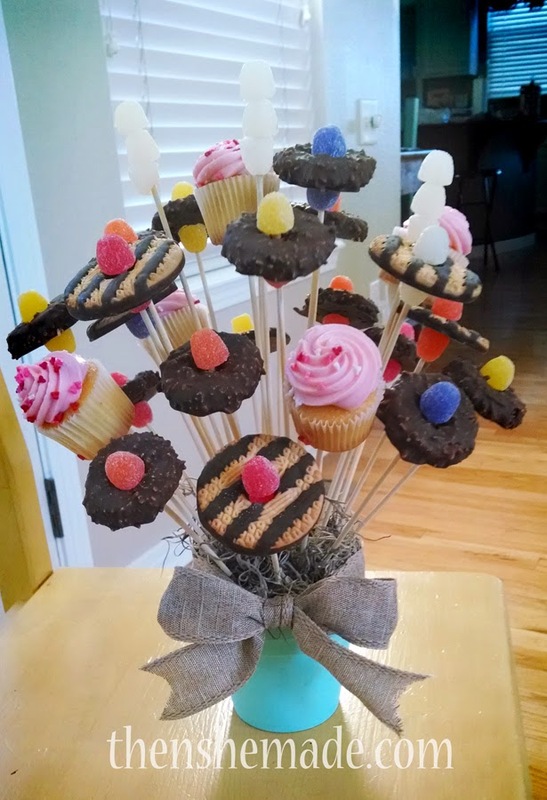 Like the cookie bouquets above - really, who doesn't smile when they are given a cookie bouquet?! So stay tuned for those posts and be thinking about what you can do to share kindness! I'm excited. Might even just start early! Such a wonderful idea! I hope more people will get addicted to this kindness thing! I started doing an act everyday after watching my husband suffer from pancreatic cancer. I realized then that life is so short (he was 43), WE MUST BE KIND TO EVERY ONE!! EVERY DAY! So I do something every day for some one for 25 years now! Blessings to you for sharing your kindness!! Teri D.